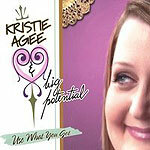 CD review: "Use What You Got"
It was only a few days after jazz great and Turbula mentor Jimmy Cheatham passed that we ran across Kristie Agee & Big Potential on MySpace.com. With a gal singer featuring a big-as-all-outdoors voice and a little big band led by her trombone-playing husband  well, not hard to imagine Jimmy had a hand in steering them our way, now is it? Not when Jimmy and wife Jeannie and their Sweet Baby Blues Band kept that Kansas City big band blues flame burning all those years out of their San Diego base. The photographic evidence on the sleeve of their debut CD from last year suggests that both Agee and her husband, Roy, are comfortably plus-sized. Which would explain the inclusion of songs like "Big Fat Mamas Are Back In Style," "Fat Meat Is Good Meat," "Meat On Their Bones" and "Big Red Caboose," all of which celebrate the joy of loving large women (which thematically reminds us of another San Diego based blues singer, Candye Kane). More to the point, each of these songs, plus the other six filling out the CD, are delivered with humor, outstanding musical chops, and as tight a horn section as you'll hear outside Jeannie Cheatham's combo these days. Not as purely Kansas City-focused as the Cheathams, the music of Big Potential is definitely influenced by the swing revival of the '80s and '90s. There's as much Brian Setzer as Jay McShann here, as well as a strong streak of Texas blues  Roy Gaines and Clarence "Gatemouth" Brown. But Roy Agee is a solid arranger (and a mean 'bone player to boot), and the band's album shows a consistent approach, a definite Big Potential sound: soft comping behind the vocals, sharp horn choruses punching in as punctuation. Kristie's voice is deep, rich and powerful. The result is a convincing big band sound, albeit with only a small horn section, one that looks forward rather than back, that melds the blues and jazz, Kansas City and Texas.